Boaters Paradise!!! This 2BR/ 2BA Condo will put you in a great development with a true since of community. Located just off of Canal Rd, means you are literally minutes from everything Orange Beach has to offer including many shopping and dining options. If you're like most of the residents, you could just hop in your boat that&apos;s cradled in a nice 10,000lb lift and quickly be fishing in the Gulf of Mexico, Robinson Island, or at any of a number of local restaurants, marinas, and shopping venues. 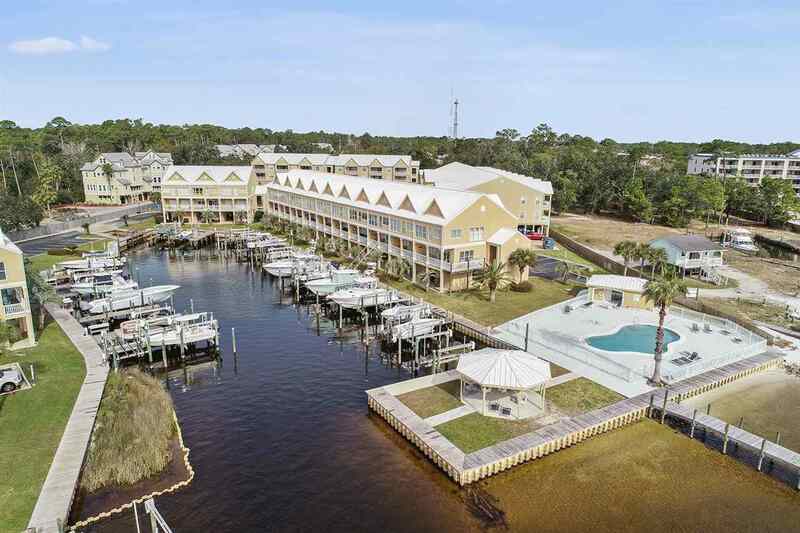 This particular unit features, plenty of storage, matching tile and granite counter tops throughout, nice en suite bath with Jetted tub, water closet and great views of Terry Cove just off the balcony. There is plenty of storage space plus two covered parking spots below your unit, which is close to the elevator. The complex has 2 outdoor pools, waterside gazebo, and nicely manicured grounds. Come and get your piece of paradise and enjoy the Salt Life! NOTE: Home Inspection Available Upon Request. Directions: From The Wharf - Travel East On Canal Rd. Past Doc&apos;s Seafood Shack. Walker Key Complex Will Be On The Right, Right Past Sam&apos;s.